I think buying a chair mat is like ‘killing two birds with one stone’. 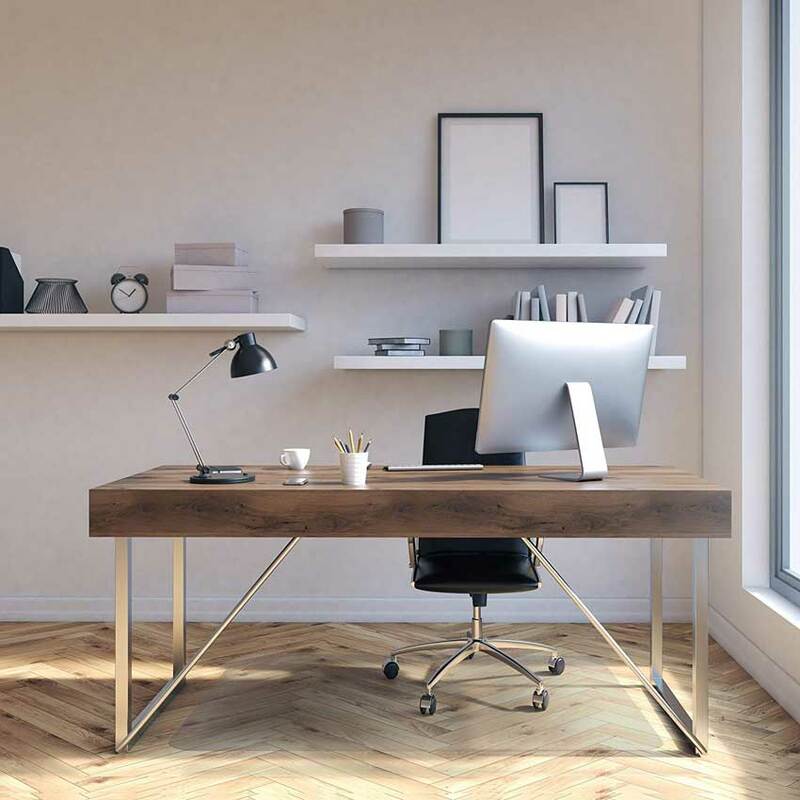 Whether you work at your office or your home, your floor needs protection from the damages that can be caused by the chair. At the same time, your chair’s bottom panel also needs some care to ensure your free movement all the time you sit on it. With the best chair mat, you can get both protections at once. 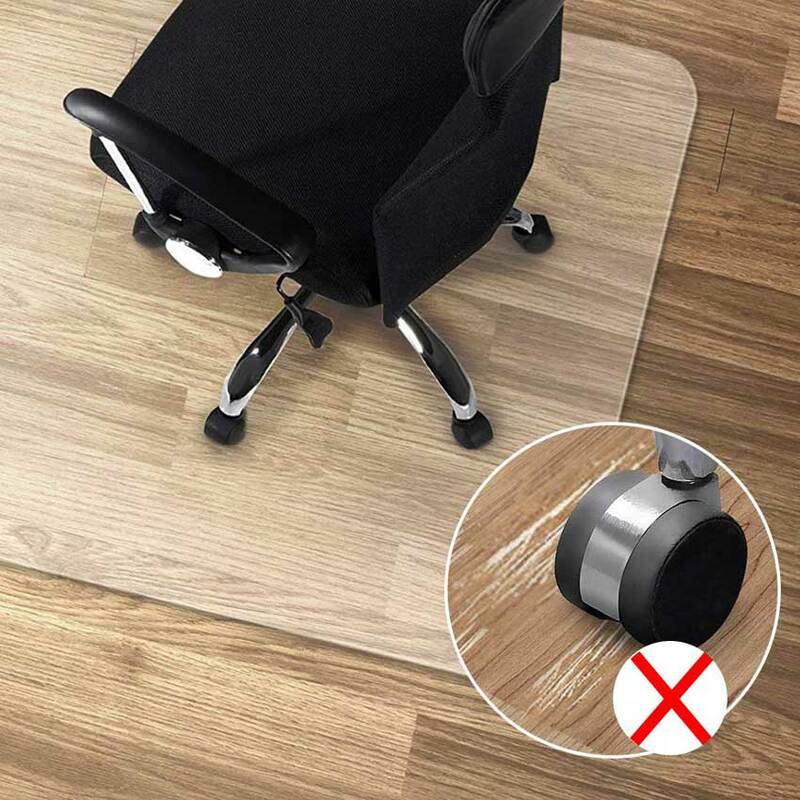 When you install a mat between the chair wheels and floor, both chair and your room surface will be safe as they will not harshly touch each other. Did you notice we said the best chair mat? Not all chair mats are going to work for your surface. You must choose the one that is specially made for your type of floor. If your office or home floor is made of hardwood, we can help you suggesting some top-grade mats for your hardwood floor. Hardwood floors are made of three layers of solid wood and covered with a protective finish. This protective finish usually is done with premium materials and needs special maintenance. Why You Buy A Chair Mat? What You Need to Think Before Buying? 1. Do chair mats prevent chairs from slipping on the ground? 2. How do I get my chair mat to unroll and lay flat? 3. What are the best casters to use with chair mat? 4. How do I clean my chair mat? 5. My floor is already scratched / cut does a chair mat work for me? 6. What is the maximum weight limit a mat can take? 7. What are the difference between “traditional” mats and “polycarbonate” mats? 8. What happens when I cut or trim my chair mats? 9. Are chair mats suitable for underfloor heating? 10. Do chair mats smell? A good number of hardwood chair mats are out there in the market, but we just reviewed only ten! Why? Because we wanted to make your choice easy and faultless. We are confident that, after going through the key benefits and features of each mat, you will easily understand which mat will be the best for you. If you love cleanness and need an office chair mat, Deflecto has something to serve you. Deflecto is a famous name in office supplies production industry. For the people who love transparency and are in need of floor protection, Deflecto made a durable floor pad for them. 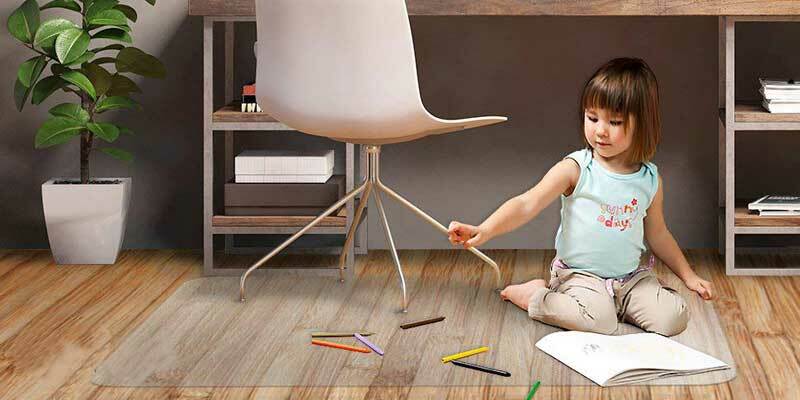 Deflecto Chair mat will protect users’ floors from any unwanted marks without hiding the floors’ visual beauty. This mat is also for them who just knew about this kind of floor pad but insisted not to hide their well-crafted floors. With its multi-layers features, this mat will ensure users’ safe and relax time on the chair. Clear vinyl chair mat will protect your floor from any scratches, wear and tear. This mat is a hard floor specialist. It is best known for protecting hardwood, tile, laminate, linoleum and concrete surfaces both home and corporate areas. Mat is durable and perfect for ongoing day to day usages. It doesn’t matter whatever your busy work schedule in front of your desk. The mat is ready to provide yearlong protection. The mat is manufactured with free as well as clear non-phthalate and non-cadmium materials. This combination gives it a transparent look that promotes a healthy work environment. When you are on the mat you will be balanced on the floor. Its non-studded bottom surface provides superior non-skidding power over the hard floors. Also, its straight edges will ensure your seamless transition from chair mat to hard surface as well as floor to the mat. Deflecto EconoMat Clear Chair Mat protects your floors and prevents all kind of wear and tear on your chair. Its non-studded bottom surface provides strong gripping over any type of floors. Its straight edge ensures seamless And all the materials used is safe and healthy, and also offers exceptional durability. 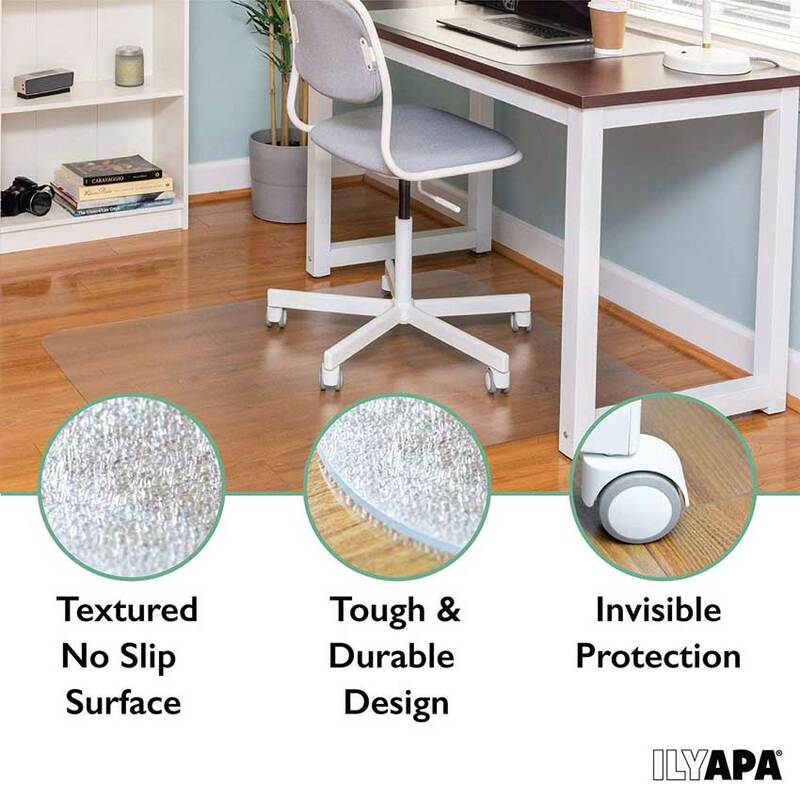 If you are looking for the best price-quality chair mat for your hardwood base, this floor mat from Ilyapa can be the best option to purchase. Ilyapa chair mat is one of the top-rated chair mats on Amazon. A seamless combination of both affordability and value made this floor pad popular all over the e-commerce stores. People really admire this Ilyapa mat’s design, durability, and easy installation features. Just like our first chair mat, this one is also a hard surface specialist. This Ilyapa mat is the perfect pick for hardwood, tile, laminate, concrete, and vinyl floors. The mat is always ready to provide its top class gripping and protection on those surfaces. One impressive feature of this mat is, it will not sacrifice the aesthetic appeal of your floor while protecting the floor. Its transparent design makes the real color and outline of the floor visible. The mat has the capability to withstand against any chair. It’s made of durable materials. As a result, you will get the uniform protection all over the year, not the cracks, curls, odor or discoloration. Along with essential features, the manufacturer also cares about the installation process of the mat. Unlike other chair mats in the market, it comes in a flat shape. So, you will not face any hurdle to flatten the chair mat. Simply unpack it and set on your desired corner. Like other Ilyapa’s textured office mats, this one is also slip and scuff resistant. It will stay neat and new every time. The cleaning is easy too. If you ever notice any spills on the mat, you can clean it wiping with a soapy dish-cloth. The best thing about Ilyapa is they ship all of their office mats flat, not rolled up; so, you don’t have to struggle to flatten them. Even the mat protects your hard floor from any kind of scratches and marks, it’s transparent and keeps your floor color and design visible. Its textured design makes it slip and scuff resistant. And can also be cleaned easily with soapy dishcloths. If white is your favorite color, this one is going to be your mat. 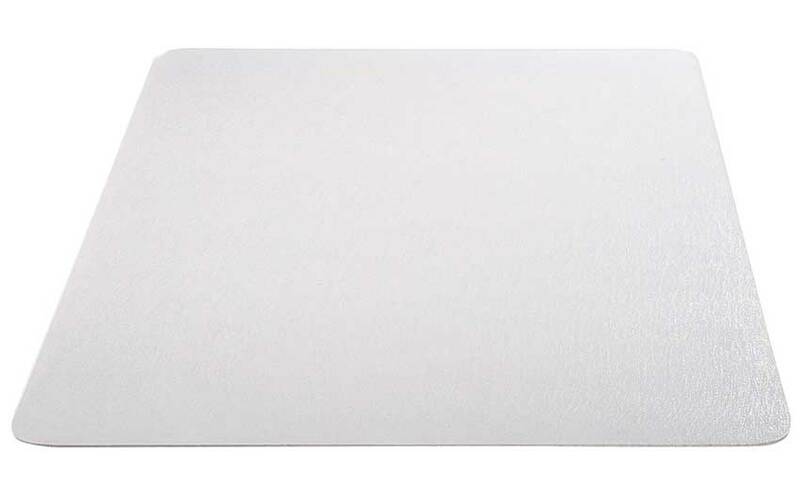 This mat is out-and-out pure white. Even if your floor surface is not white still you can choose this, as white is a standard color that matches with almost any environment. This Lesonic mat is uniquely designed. It will add a fresh and gentle vibe in your work desk with its outlook, rigid body structure, and solid protection. Overall, you will have the opportunity to enjoy its solid performance all over the year. This unique floor pad allows your office chair wheels to move easily while carrying out daily tasks. It’s a super durable chair mat. It will not crack, bend, break, or even discolored. The mat is made for covering hard surfaces, also rigid enough to support heavy duty equipment. Other than using this mat under the chair, it also can be used under the computer desk, plants, ornaments, crafts, and more places. This Lesonic mat featured with 100% non-slip backing. As a result, users get complete stability on the floor. Some users complained about the slip, later the manufacturer solved the problem with expertise. The upper panel of the mat also features a special type of texture. The function of this texture is not just to prevent slipping, it also allows the chair to move gently around the pad. And during the movement, the user enjoys great controlling on his every move. This hardwood floor and under computer desk mat is PVC, BPA and phthalate free white polyethylene. The upper panel of the mat features a special type of texture. It lets the chair casters move easily and freely without any possibility of risk of leg fatigue. The upgraded the mat recently and added 100% non-slip backing. Now there is no possibility of slipping and you will have complete stability. Lesonic provides a 100% 60 days money back guarantee so that you can be worriless. 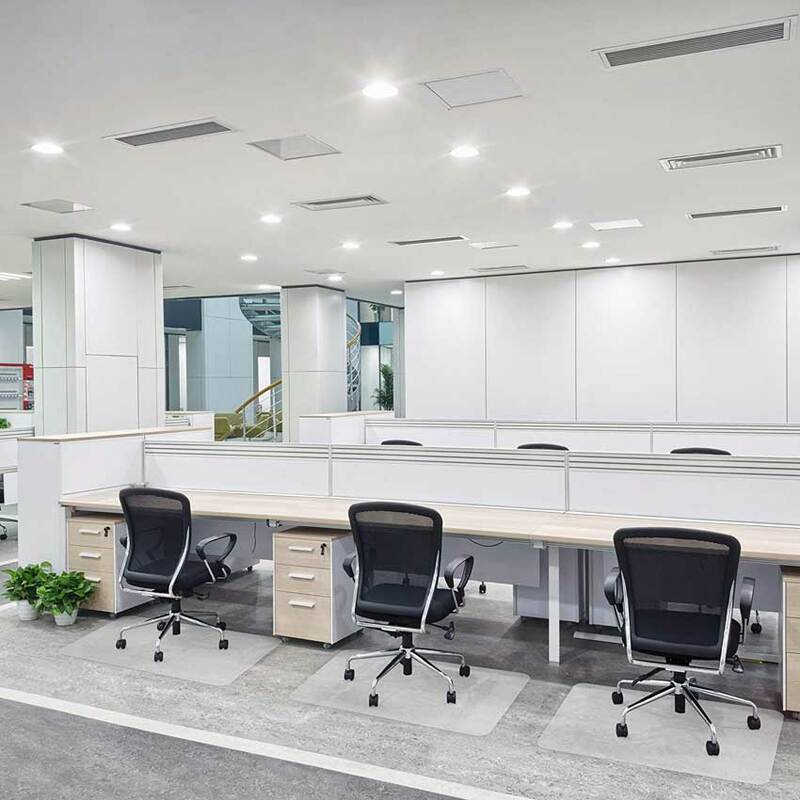 The industry-leading manufacturer Office Marshal is always committed to providing premium quality products for home and office without a heavy price tag. This hardwood chair mat is also an example of their commitment. Starting from the standard white transparent design to its durability, stability, and environment-friendly product materials, it’s out and out a good choice for any house owner and office operator. The mat is thick and sturdy. Durable polypropylene materials have been used to manufacture this mat. Sturdiness empowers this mat to prevent cracking or shattering for the long period of use. The bottom side of the mat is lightly coated. This coating enables the mat to be stable on the hard exteriors. So, you will get extra firmness using this mat on solid ground like tile, laminate, and hardwood. Some low-quality mats smell bad that spoils the working mode inside of an office room. But this chair mat is 100% odorless, also free from BPA, phthalate, PVC and volatile toxins. Basically, it’s a mat for a healthy workroom. The unique surface texture allows you to move freely sitting on the chair. It features enough grip to maintain controlled rolling. Also, the chair doesn’t skid around. So here on the mat, you surely enjoy you every minute as you have the freedom of moving to any direction smoothly. This polypropylene made OfficeMarshal chair mat is thick and sturdy. Also, soft to prevent any cracking or shattering. The mat is specially designed for hard surfaces. It has anti-slip and slightly coated underside, and they prevent slipping. The mat is 100% indoor air friendly. Its materials are 100% odorless and BPA, phthalate, PVC and volatile toxins free. Its unique surface texture allows you to move easily but has enough grip to maintain controlled rolling and reduce the risk of slipping. Marvelux rectangular chair mat is a great value protective solution for the user who has a limited budget. The aim behind manufacturing this mat is to make an affordable unit with long lasting floor protection for both corporate floors and home areas. If you use this Marvelux mat, you will get all the performance that a good performing mat offers with an environmentally friendly way. Because this mat has no harmful substance like phthalate, toxins, cadmium, tin, and lead. Marvelux’s chair mats are proven to reduce users leg fatigue. All of their chair mats are ergonomically designed with a smooth glide exterior. This design also provides a comfortable room for easy movement taking the strain off your back and legs. Having plane surface of this vinyl chair mat, you can glide around sitting on the chair effortlessly. Here all of your movements will be controlled. The smooth but gripping surface ensures both control and effortless movements while preventing slipping and skidding. This chair mat is not for carpet covered floors. Its exterior design effectively and safely adheres to hard surfaces such as vinyl, stone, tile, hardwood, laminate, and concrete. Using on these floors you will enjoy both freedoms of posture and protection of your floor. Mat comes with a rectangular shape, which suits any artistic floor design. Rectangular shape has equilibrium opposite sides, so you can use the mat both vertically and horizontally. If you move back and forth more you can use it vertically, otherwise horizontally. Marvelux 36″ x 48″ Vinyl (PVC) Rectangular Chair Mat is specially made for hard floors. It ensures good control, comfortability and ease of movement. And also considerably reduces leg fatigue. 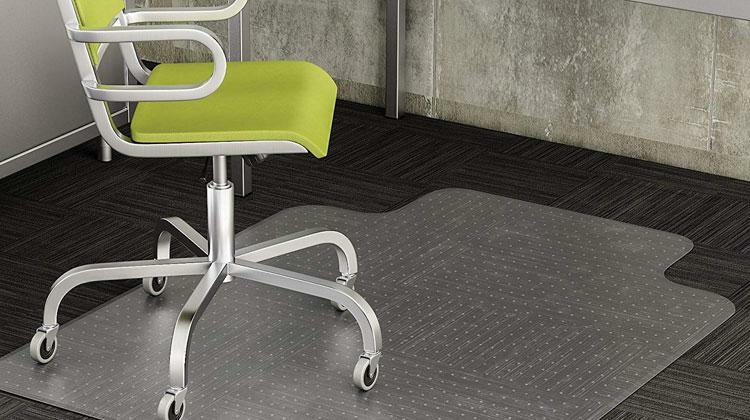 The mat safely adheres to hard surfaces to prevent all kind of floor damages that your chair may cause. Marvelux ships the mat flat so that you don’t have to work hard to flatten it. This multi sizes chair mat is the third consecutive member from a certain manufacturer named Office Marshal. Because of this brand’s wide popularity and product quality, we didn’t hesitate to enlist more products from a single manufacturer. If you have already spent a handsome amount of bucks for the beautification of the floor also feeling the need of chair mat for its protection, you can get this transparent mat. Its transparency nature makes the artistic beauty of your floor visible yet fulfilling your protection needs. This mat is certified with the Blue Angel eco-label. It’s an eco-friendly solution for floor maintenance needs. It’s also a great way to reduce your carbon footprint whilst maintaining a healthy vibe inside your working palace. As the pad is free from odor and volatile toxic compounds. The eco series mats are rigid and durable. They are able to protect all hard floor surface including wood, laminate, tile, stone, and vinyl. Because of their rigidity, the mats can absorb any force from the chairs. At the same time, they ensure a smooth free surface for the chair movements. You can move the mat to any corner of your office you want. It is Curl, crack, break, and scratch resistance. So even if you use the same mat for different purposes, it is committed to giving the same fresh vibe all around the year in every aspect. With only 4.9-pound weight, the mat remains stable on the ground. This weight and anti-slip design on the rear panel prevents the mat moving with the chair. But, you can move on the mat without any hassle. Office Marshal Chair Mat is made from 100% recycled PET and certified with the Blue Angel eco-label for a healthy indoor environment. The mat is made from100% odorless, recyclable and BPA, phthalate & tin free materials. The mat has a unique surface texture so that the chair doesn’t skid around. It also provides enough grip to maintain controlled rolling and reduce the risk of slipping. This best-selling chair mat is transparent, yet durable in every way. It is a blurred chair mat from the Matdom. It’s neither fully transparent nor fully white. So, if you like slightly white vive than a pure out and out white mat for your home or office environment you can go for this. Moreover, if your floor has little scratch but good artistic design you can also choose this one. This blurred mat is featured with multiple usability. Though it’s a floor protection mat you can use it for your other needs too. Its clear design and rectangular shape gives it a fresh look. Wherever you place the mat it will match with its surroundings. Designed with a smooth backing, this desk chair mat is thick and works best on the solid surfaces. It also comes with a proper measurement of thickness that is able to protect the floor from stains, scratch, and any damages caused by the continuous movement of the chair. Using this mat your feet will also get a comfortable space for resting. As a result, even if you work for a long period of time you will feel fewer fatigues in your legs. Mat is also environment-friendly, so you won’t have any issue with your health too. Working on a moving chair reduces the body stresses especially when we have to work for a long time in a single sitting. Here mat’s rigid textured surface will keep the wheels in place. Also, enable you to control these wheels when you want to move front to back and left to right. This protection mat is made of durable materials. It will not wobble, shake or separate under heavy loads. Even if you weigh 200 – 300+ lbs., the floor mat is strong enough to support your body weight. If you are a new user of chair floor mat you also can fold and unfold the mat easily. Manufacturer provides an instruction sheet on how to make mat flat. Additionally, after the use of a few weeks, you can clean it just wiping with a piece of cloth. Komene Office Chair Mat is specially made for hard floor protection. Its slightly textured top surface is anti-slip. It provides enough grip to maintain controlled rolling and reduces noise from casters. The mat is long-lasting and heavy-duty. It can weigh 200 – 300+ lbs. without any crack, chip, break or shatter. The mat is made from 100% non-toxic materials. It’s another colorful floor mat from Lesonic. This time it comes with black color. Black is also another form of standard color that suits most of the surface structures especially the casual constructions. The most positive aspect of this Lesonic black mat is you need to clean it too often than a white or transparent mat. Overall, it will give you a safe reliable working experience in front of your desk in an environment-friendly way. With this floor pad, your floor protection will be decorous one. A rectangular black pad under the chair will add an extra dimension to your home or office furniture arrangement. whether it is hardwood floor, tile, laminate or even concrete surface it will give you its ultimate protection in a stylish way. Under panel of the mat is different from the front panel. While front panel is designed for controlled moving later one is designed for firm gripping. So, you can move anywhere but your pad will be just in its position. The mat is built to last long. 100% pure long-life polyethylene materials have been used to manufacture this thick and sturdy mat. As long as you use the mat there is no chance of cracks, curls or discoloration. This time Lesonic also doesn’t compromise to the safe usages of the mat. This black pad is odorless and has no BPA, phthalate & PVC, and volatile toxins. Moreover, it also features long-lasting protection against day to day wear and tear with dirt-resistant formula. 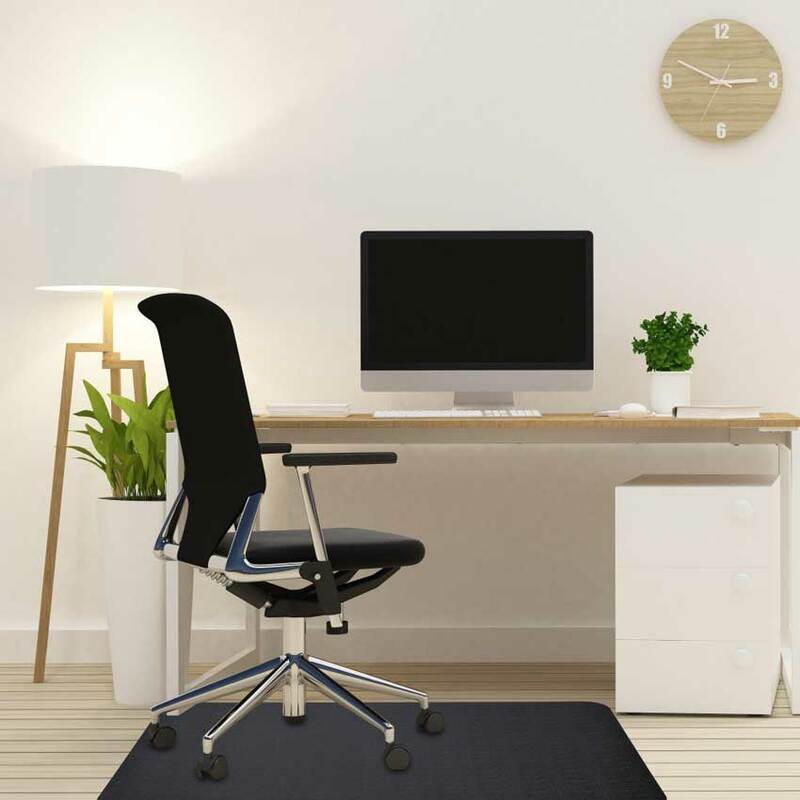 This Lemostaar’s multi-purpose 35×47 inches black office chair and desk mat is one of the best mats for hard floor protection. The mat is rectangular shaped and has the anti-slide coating on the underside to prevent the risk of slipping. The mat is made from thick and sturdy 100% pure long-lasting polyethylene materials, so it is very strong and durable. The brand Office Marshal has become synonymous with high-quality and sophisticated design for both home and corporate environments. Every aspect of their mats has been designed, tested and approved by the experts. So you will not be anything less than a winner choosing their mats. This 4.6-pound mat belongs all the properties of a Marshal mat. It is an incredibly versatile product that can be used for other purposes without just placing under the chair. A unique non-slip backing ensures complete stability for every task you do on this marshal floor pad. Pure transparency features of the mat will let your floor’s aesthetic beauty to flourish even if it lies under the mat. The crystal-clear design also suits almost every working space whether it inside your house or a busy corporate environment. This mat is widely known for using under the chair, but it also has features for using other purposes too. It can be a great solution for messy eaters- of the pets. The mat will also work well as a floor protector for homework, space for study and children playground. The mat protects your premium finishing floor from any kind of stains, water bowls, and pet food. Now you can move your chair on and off as many time as you want. You don’t have to think that your wooden floors or carpets will be affected by your moves. They will be safe under the mat. Staying constant in a place or position is always boring. It also makes mental and muscle fatigues. 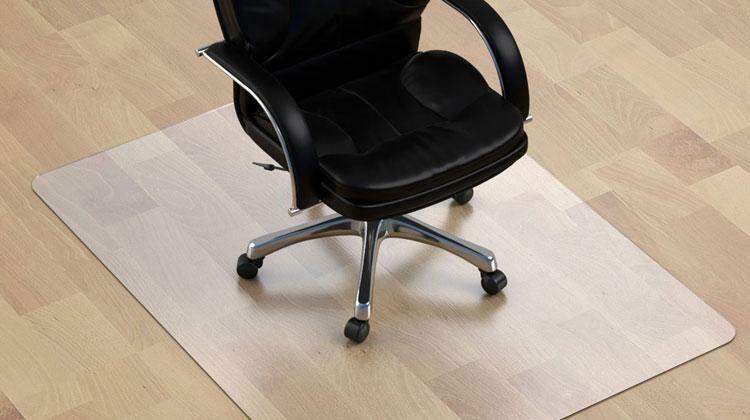 With this mat, you are allowed to do the effortless movement with your office chair. Free movement during the work helps to give up work stress and enjoy a friendly working place. Office Marshal PVC Chair Mat will not crack, curl, break, scratch or discolor. Pure transparency feature of the mat allows the beauty of the floor to flourish. Even if it is widely known as chair mat, it’s a multi-purpose mat and can be a great solution in most of the cases. It prevents against all kind of wear and tear caused by office chair casters and ensures complete stability on any hard floor, yet it’s very smooth and soft. If you really like black color and think the black color will match with your workstation ambiance, you can choose this one. This rectangular black mat will take care of both your wheels and floor. Like other mats of the brand, Lesonic gave this mat a unique textured design that looks good on any dark surfaces. Moving to the build quality, the mat is the result of top grade supplies. Because of its rigid build quality, this mat can support heavy duty equipment without sacrificing its original shape. Once you buy this mat you can use it for a long time. It is firm and durable. Also, any kind of crack, bend, scratch or discoloration will not affect your mat. You can enjoy the freshness of your mat all over the year by just simple cleaning. It is a 100% pure polyethylene desk mat. Even if you are a strictly health conscious person you will also like this mat. The mat is odorless and free from harmful substances like PVC, BPA & Phthalate, tin, lead, and other metals. Though the mat primarily designed for hard floor surfaces like Hardwood, Tile, Linoleum, and Vinyl, it is also perfect for some other usage. You can use it also under the computer desk, plants, ornaments, and crafts. The entire body of the mat is textured in two ways for two different purposes. Upper layer let you move smoothly on the mat and the lower layer will ensure a firm attachment of the mat with the floor. 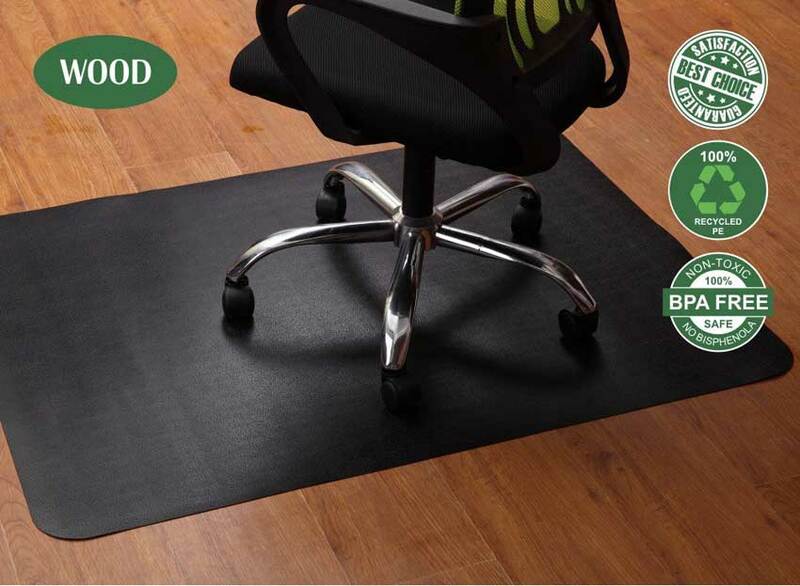 Lesonic black office chair mat is made of 100% pure odorless, long-lasting, BPA, phthalate, PVC and volatile toxins free polyethylene materials. The mat is supper-durable. It will not discolor or get scratched in long-time use. The mat can be used for multi-purposes and it features anti-skid backing that provides 100% non-slip stability on hard floors. The mat comes with a 60 days money back guarantee. Not all the office chairs have mats under them. Chair mats are compulsory for a premium hardwood floor, but it’s complimentary for other types of floors. However, having a chair mat under the chair, you can surely enjoy some extra advantages. Let’s see some key benefits a person gets when he has a chair mat for his hardwood floor. Mats protect the office/home floors from deep scratches and damages caused by the chair wheels. An ergonomic solution for easy rolling/gliding on the floor. Keep the office floor fresh and clean all the time. Support against imbalance that causes to falling on the ground. Keep the bottom panel of the chair protected from being broken. Reduce the infrastructural maintenance cost of the office. Add a new vibe to the floor decoration. Make a safe and comfy place for your legs. Interestingly, if you calculate the market value of these benefits against the cost of a chair mat, first one will be significantly higher than the later one. However, if you want to get all these benefits by purchasing the best chair mat for hardwood floor, we just want to assure you that we are going to help you thoroughly. Here we prepared a detailed list of some top class chair mats and a buying guide. The guide explains important factors that a buyer has to consider before buying. Which size mat will work for my surface? What I have to consider before buying mats? These are some of the common questions people often ask the seniors when they plan to buy their chair mats. We have covered some frequently asked question just above this section. Though FAQ section covered some crucial information related to chair mats, we don’t think those might be enough for all of our readers. That’s why, in this section, we will guide you how you buy the best chair mat for hardwood floor that satisfies all your needs and requirements. You just have to follow the guide step by step. The reality behind every successful purchase is knowing about the important features of the product. Here we are going to discuss the crucial factors that you should consider when you go buying your mat. The first factor you have to consider before buying your mat is your floor structure. Not all floor mats will be perfect for your floor. There are specific mats for carpets, and for hard floors. Hard floors are usually made of hardwood, tile, laminate, linoleum, and concrete. Actually, all the floors are built on a hard construction but when carpets are used to cover them they become carpet floors. You have to consider floors because the mats are made for carpets are totally different from those are made for hard floors in terms of rear gripping and texture. If you are unable to choose the right grip mat you will have a chance of slipping and losing balance. Building materials play a vital role in keeping office or house ambiance fresh and healthy. Also, the durability of the mat depends on the ingredients. So you need to know about the materials have been used for your mat. Traditional mats were made from PVC-poly vinyl chloride. But now polycarbonate and polypropylene are used to manufacture the mats. The use of polycarbonate and polypropylene makes the mats more durable and health friendly. Also prevents curl, crack or discoloration over time. So if you want to get high-end service and a healthy working ambiance all around, you should go for modern polycarbonate made mats. Interestingly, some famous manufacturers already launched their eco-friendly series of floor mat. That really makes the job easy for a buyer to get the best for his job. Size matters for the mats. Though nowadays mats look good and they also work as a way of beautification for the floors, a user hardly wants to cover his aesthetic floor with a mat. On the other hand, if you select a mat that is smaller in size and inadequate for movement and resting legs, won’t fulfill your needs. Before deciding the size, you can measure the free space where you want to set up the mat. Don’t worry, if your place is too small or too large you will get a mat for it. Even if you don’t get your desired size you can order a customized size. But, never go for a too long mat that goes even under the furniture. Choosing right shape mat is important because it’s directly related to your furniture arrangement. For example, Lightbulb mats are best suited for the corner and l-shaped desks. If you can match your furniture arrangement with right shape mat, it will add an extra essence of decoration for your office. When you buy a mat, assume a shape in your mind then look for that types of shape to the seller. If you need leg rest space of mat you should consider it too. Rectangular, square, lip, L-workstation, contoured, triangular, round, and oval are some popular shapes of the chair floor mat. Among all the shapes, rectangular mats fit with the most office desk configurations. You can choose any color and design you like. But your choice should be based on your floor construction and your taste. Most chair mats are available in transparent, pure white, pure black, and mixed color formation. Also, some mats have colorful designs on them. Transparent mats are a good choice for a wooden and designed floor. Pure white is a good pick for any office environment. Black and other mats are good for both casual and formal usages. All the mats produced by famous manufacturers have two grades of gripping. Both the front and rear part of the mat have different textures. And the functions of those are also different. Front textures allow the user to do little movement around the chair mat with utmost control in his hand. Inversely, the back-end gripping firmly attaches the mat on the floor or carpet so that users never face any sliding. One of the purposes of buying a chair mat is to be stable on the floor. So, don’t sacrifice the gripping issue at all while buying. Eco-friendliness means the mat will not smell and must be made with eco-friendly materials. The world is getting warmer day after day, so we should move to environment-friendly productions also should encourage those producers by choosing their products. Moreover, this type of mat also good for human health. It’s a common incident that happens with every would-be user that he/she always wants to know more and more about the product he/she is going to get. By extensive research, we gathered some questions those are frequently asked by the chair mat buyers and users. Also gave the most accurate answers to those questions. Going through this section you will get to know some additional information and facts about the chair mats, their use, maintenance, installation and care. Yes; they prevent slipping. Top rated chair mats are designed with two types of gripping. Upper panel gripping ensures proper stability that also allows the user to have maximum control over every movement. And, the back textured gripping helps the entire loads of the mat to be stable on the surface. Normally the manufacturers provide an instruction manual for installation. However, if you don’t get it just follow our guide. Before unrolling the mat, make sure that the mat is in room temperature. Now unroll it and lay down on the surface where you want. In the beginning, it may not flat well. To flat it properly, put some weights on each corner of the mat and leave them for 12 to 24 hours. Soft and wide wheels’ casters are preferable for a chair mat. If the chair has steel or narrow wheels, premature wearing of the mat may occur. In general chair, mats should be lifted up occasionally to clean the underneath area of the mat. This lifting and cleaning also prevent strong attachment of the mat with the floor. However, if you want to clean the mat, you can use a wet cloth soaked in soap-water. If your mat is made of Polycarbonate or Polypropylene you can use all common household cleaners. Mats are made of those two materials have strong resistance capacity. You can use a chair mat even if your floor is damaged. In such cases, colorful or designed mats will be the best option for you. These mats will cover up the damaged areas also protect the affected area from further damages. The sustaining capacity of the mat depends on the material it’s made of and the thickness it has. Typically, a mat that is made of polycarbonate and polypropylene with 2mm thickness can sustain any weight up to 1000kg. Both are different from each other in terms of building quality and durability. Traditional mats were made from PVC-polyvinyl chloride. Those mats are softer and more pliable than “polycarbonate” mats. Polycarbonate mats are highly rigid and resilient. They also offer superior clarity and do not curl, crack or discolor over time. It is not encouraged to cut or trim the original shape and size of the floor mat. If you do that, it will impair the performance also invalidate the guaranty policy. Moreover, the company you bought the mat won’t take any responsibility for any damage or injury caused. However, if you need special shapes or sizes mats for your office, you can contact the manufacturers. Most of the renowned manufacturers provide customize mat service facility. Not all the chair mats are suitable for underfloor heating. The suitability depends on the plastic materials that are used to manufacture the mats. Experts recommended not to use PVC chair mats on underfloor heating or in direct sunlight. Because PVC mats contain phthalate plasticizers, these outgas from the mat over time, mainly when the material is heated. It causes various health risks including a breathing problem, asthma and unpleasant smells. Various types of compounds are used in the manufacture of chair mats. Whether the mats smell or not it totally depends on those plastic compounds. Chair mats those are made from PVC can cause unpleasant smells and also raise health risks such as asthma or allergies. According to research, an office employee moves his or her chair more than 300 times in the average eight-hour workday. Now think if your floor is made of some precious supplies, what can happen to it! Every time chair wheels contact with the floor will leave marks. These marks get stronger day by day. Sometimes they turn into permanent damage. Anyway, in this situation, having a best chair mat under the wheels can save your floor. And the most interesting fact is the repairing cost of any finest quality floor will be much greater than a chair mat cost. So, owning a chair mat can save both your purse and floor.